Sheraton Qatar ... as good as new. QATAR-BASED main contractor Urbacon Trading and Contracting completed the renovation of the Sheraton Doha in record time on schedule to host the 35th session of the Supreme Council of GCC Leaders, which proceeded as planned in Qatar last month (December 9 and 10). UrbaCon was singled out as the only contractor confident to take on the renovation of the 32-year-old structure commencing from May 2014. With careful attention to detail being paid to the hotel’s original 1982 design, the building was entirely renovated from the ground up including all 371 rooms, nine restaurants, as well as all common areas, both inside and out. At the peak of renovation, a team of more than 16,000 personnel were working on the renovation, including highly qualified engineers, interior designers and project managers. “The delivery of this project was a significant challenge which was only made possible through a coordinated approach organised with military precision,” Al Khayyat concludes. 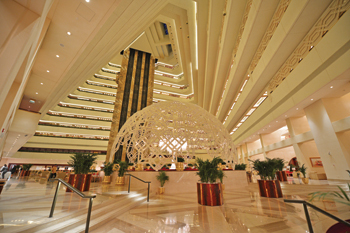 The iconic Sheraton Doha, which is owned by Katara Hospitality, was the first five-star resort in Qatar. UrbaCon Trading and Contracting is a Grade One licensed contractor based in Qatar. With over 30 years of experience in the field, UCC has delivered a broad spectrum of projects ranging from island resorts to stadia. Its current ongoing projects include the 388,000-sq-m Mall of Qatar and the Anantara Doha Island Resort.